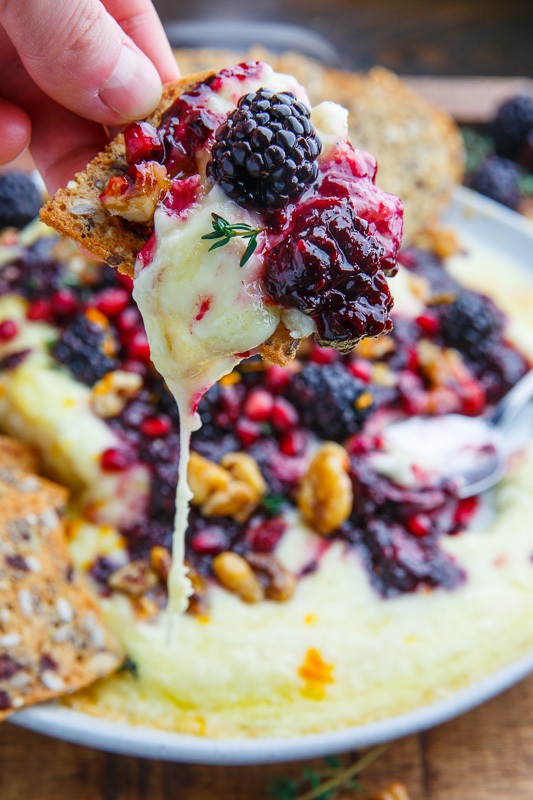 Ooey, gooey melted baked brie topped with a sweet and tangy blackberry sauce, candied walnuts and pomegranate! is melted cheese! Baked brie is the perfect way to do this! 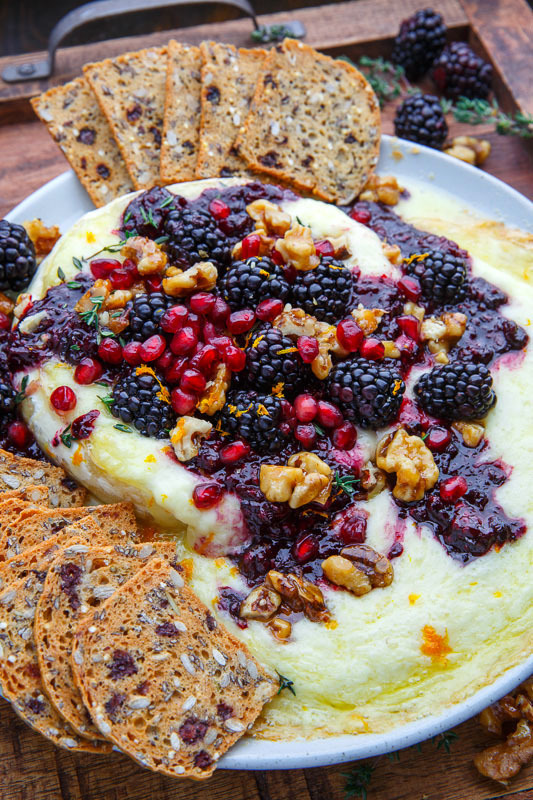 You simply need to bake the brie in its rind and then dig in, but you can garnish it with some flavours like in this baked brie with blackberry compote and candied walnuts! 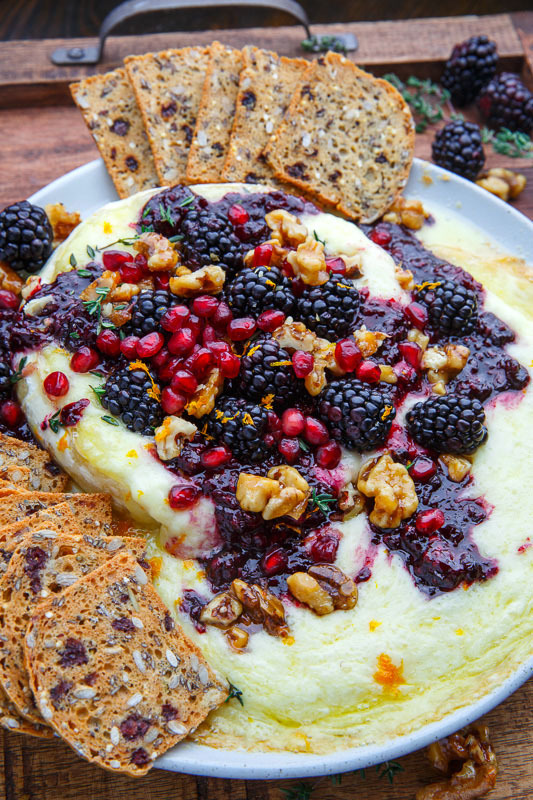 The sweet blackberry compote goes really well with the savoury melted brie and the crunchy candied walnuts add and amazing texture! 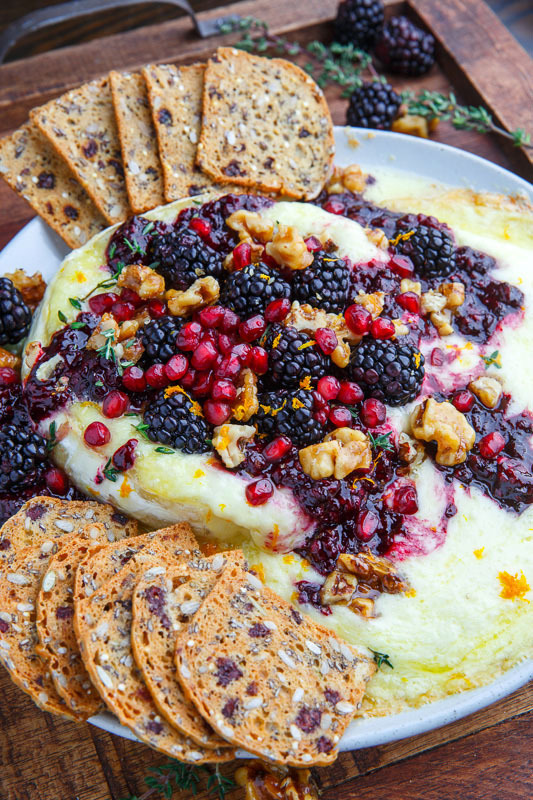 This baked brie really does not take all that much effort especially if you make the blackberry sauce and the candied nuts a day ahead of time. Once you have them ready you simply need to bake the brie until it’s all nice and melted and good, top it with them and dig in with crackers! 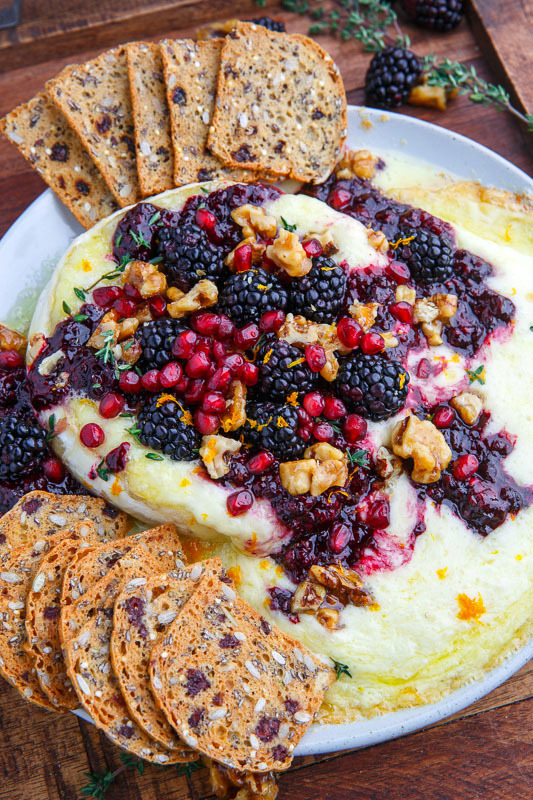 This baked brie with blackberry compote and candied walnuts is perfect for the holidays, whether it’s entertaining family for Christmas or Thanksgiving or its’ friends for a New Years Eve party, or, lets be serious here, making a it just for yourself (because you deserve it)! Heat the butter, sugar, salt, cinnamon and cayenne in a non-stick skillet over medium heat until the sugar has melted and is simmering, add the nuts and cook until the sugar has is simmering again and the nuts are evenly coated. Pour the nuts onto a non-stick pan (or parchment paper or a silicon mat) and separate with forks before letting them cool. Simmer the blackberries, honey, lemon, orange zest, thyme and vanilla extract in a saucepan over medium heat until the blackberries release their liquids to form a sauce and the sauce has simmered until thick, about 5-10 minutes. Bake the brie in/on an oven safe dish in a preheated 350F/180C oven until melted, about 10 minutes. Remove from oven, top with the blackberry compote, fresh blackberries, candied walnuts, and pomegranate arils and enjoy while warm! Note: The recipe for the candied pecans makes more than you will need for the baked brief tipping, which is fine since I usually snack on a lot of them before they make it to the brie anyways! Option: Use pecans or other nut instead of walnuts. Option: Use brown sugar in the candied walnuts. Option: Add 1 tablespoon maple syrup to the candied pecans along with the sugar for a hint of maple. Option: Add 1 teaspoon vanilla extract to the candied pecans along with the sugar for a hint of vanilla. Option: Replace the blackberries with raspberries, strawberries, blueberries, etc.! This looks so delicious Kevin! Kevin, what are the biscuits/bread you're serving with this? They look delicious! Do you have a recipe for them please? Kevin- this is just so beautiful and I can only imagine how delicious this is! Please advise what type of crackers are you showing with this recipe? Perfect for a new year's eve party! Kevin, get to work. I know you can come up with a suitable recipe! Happy new year to you! I just want to stick my head in Brie and inhale the lot. Thank you for posting recipe. I am not one to take time to comment, but i am sooo very glad to have discovered your site. You have become my "go-to" when I need something super yuummy and unique to try. Although new, everything I have tried has been fabulous! Thanks for all you do! You make me look like a ROCK STAR!!!! ps… those crackers you have shown are some of my favs! cant wait to see what you come up with for those. Any update on those crackers??? They look perfect! I have blackberries, and while they look impressive, they aren’t sweet at all. Should I sweeten the half cup of whole berries for the brie? I usually use Diva’s Delightful Crisps or Raincoast Crisps. Test the blackberry compote and if you feel it needs more sweetness you can add more honey. Enjoy! Where did you purchase the crackers from? The crackers are Diva’s Delightful Crisps from Costco or you can use Raincoast Crisps which should be available ate grocery stores. Have a great rest of the week and weekend coming up!